Annie works for a big state-owned research institute that occupies about 400000-square-kilometer land and she is a purchaser. It seems as she is always busy in walking. When the ordered cargos arrive, she has to walk about fifteen minutes to the site and directs unloading. Then, the goods have been tested in specialized department. After that, the tested and qualified goods should be laid up in storehouse. Sometimes, if a product has a problem during R&D course, Annie has to R&D department personally and feedbacks problems to supplier or manufacturer. Walking among different departments really makes her crazy. However, her bad situation has been thoroughly changed since she bought Fosjoas V2 self-balancing two wheel electric scooter. It really helps her a lot. Generally speaking, it just takes Annie five minutes at most to get to other departments if riding Fosjoas V2 self-balancing scooter. When taking the lift or climbing the stairs, how to handle the scooter? Just carry it by hands, because it only weighs about 12kg. In the meantime, riding is really easy. Annie can realize all controls, like speeding up, slowing down and changing direction by adjusting her body slightly. For example, if she wants to move forward, she will lean body forward a little bit. It is because Fosjoas V2 electric scooter relies on aerospace attitude control theory, fuzzy software algorithm and gyroscope system to keep itself balanced. Until now, Annie has used Fosjoas V2 two-wheel electric self-balancing scooter for several months already. According to her experience, riding it every day is even good for health. Oftentimes, she has to lower her head to work and walk. As the result, she is troubled by spondylitis. But now, her symptom has been improved largely by riding Fosjoas V2 scooter, because the backbone, four limbs and whole muscles have been exercised during the process of leaning forward or backward. That's really fantastic! 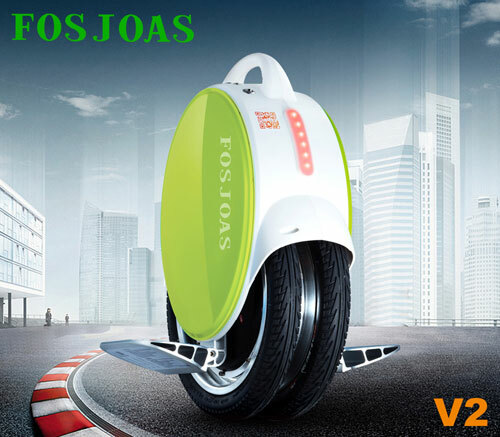 Next：Fosjoas Intelligent Balancing Electric Unicycle Develops Rapidly In The Sector.